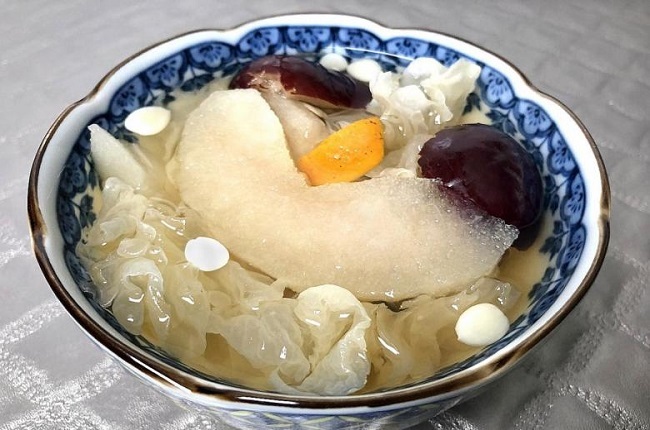 SINGAPORE - Counter the hot weather with this easy-to-cook Chinese pear and snow fungus soup. In traditional Chinese medicine (TCM), this is known as “run fei zhi ke tang” in Chinese, which refers to its function of moistening the lungs to stop coughing. But for the average healthy adult, it can be taken as a dessert to nourish the lungs, sooth the throat and dispel any heatiness. I got the recipe from Mr Walter Chua, 47, the manager of a dried goods shop in Bugis. He recommends eating this dessert soup hot or warm. His recipe does not include adding sugar as it contains sweet ingredients, such as the sugared tangerines, honey date, red dates and fresh pear. I found the results a tad bland for my tastebuds so I added 20g of honey rock sugar. 1. Soak the snow fungus for at least 30 minutes. It should be fully immersed in the water. Soak it overnight if you prefer it to be much softer in texture when cooked. Use a pair of scissors to remove the hard stem ends. 2. Rinse the snow fungus and place it in a colander to drain excess water. Set aside. 3. Peel the pear, remove the seeds, slice into eight sections and set aside. 4. In a pot, pour in the water. 5. Place the Chinese pear in the pot. Add the sugared flattened tangerines, honey date, dried tangerine peel, Chinese apricot kernels and chuan bei. 6. Add the red dates and snow fungus. 7. For stove-top cooking, bring to a boil then turn the heat down to low, and simmer for one hour and 30 minutes. If using a slow cooker, turn the heat to high and boil for two hours. 8. Optional: If you prefer the soup to be sweet, add 20g of honey rock sugar. Follow Straits Times Food on Instagram @straitstimesfood. If you try out this recipe, take a photo and share it on Instagram. Use the hashtag #straitstimesfood, mention and tag @straitstimesfood in your post.